I first talked about Marc when I covered his split with The Pipers from Bleeding Gold and he was working with a highly stylized gleaming pop back then which of course would find a perfect home on the picture disc single here. 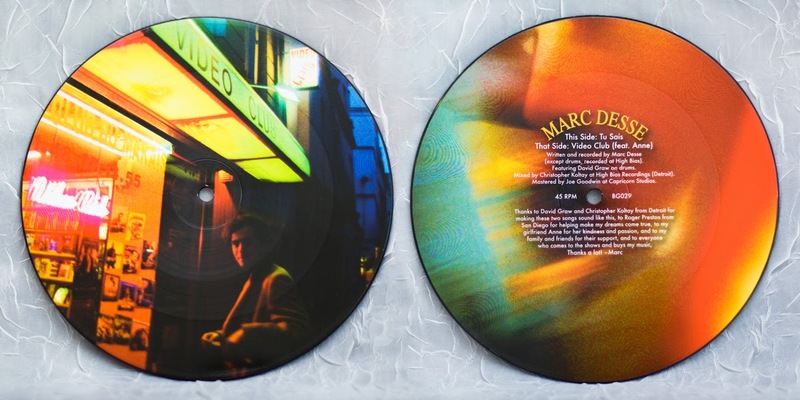 Marc reminds me of Jens Lekman in his idiosyncratic vision, it's not related to the usual strains of garage rock or punk, the kind of thing that takes a real dedication to craft to become even competent in. There also aren’t enough picture disc’s in my life. Forget 180 gram, these things are always massive, even as singles. Thanks to some weird disease I have I also only know records by their covers. If you ask me what the title of that Don Cab record that has a photo that’s green with a light from a UFO beaming down on some kind of barn or house. I have no idea. You don't need a sleeve for these Frisbee's and the mylar sleeves are like raincoats. On the track "Tu Sais" Marc takes his time to really get this strong groove on it's feet; the back and forth of jagged guitars and that pounding processed beat, the kind of beat entire songs are built around. The second you build it up from perfectly tuned kit pieces that high register electric naturally pans across the room using the open space, from the drum kit down to this hidden backup vocal. Marc's got a tight reverb throughout on his vocal and delivers lyrics in French of course but it doesn't make a difference. You know what he's getting at and as much as the production is seriously tight, he's done everything right in his microscopic attention to detail. You can hear hours spent pouring over the mic placement capturing the layers and layers of chorus guitars, playing with every instrument never leaving things at the factory default setting. A startling, blown out pop that find a home in the weird rock dance category. So catchy and put together it's almost wrong it would end up on a single, but the picture disc.... now I get it. B_Sides "Video Club (feat Anne)" opens with a chorus bassline that's just the beginning of the heavy produced madness to come, like Nico and Lou they work on this duo sound. Something of the just crazy instrumentation, the drums are huge here too, taking over the track, almost over this synthed out guitar. Marc's delivering a come hither low end echo vocal with a slight Magnetic Fields style to this. Endless amounts of instrumentation, none of it organic, it's heavily processed which in Marc's hands can really sound completely alien, so weirdly perfect its hard to relate to. It also hints at Ariel Pink in here the number and layers of effects and how things are used with precision for that perfect stab in the ear. Get this from Bleeding Gold Records.